SUMMER is in full swing. Schedules are different and kids are at risk of being bored. Here are some inexpensive ideas for fun with the kids this summer ~ when they are not catching up on the summer reading list! 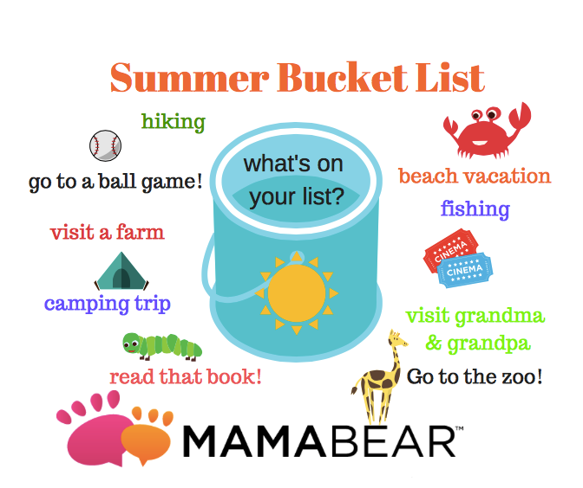 What’s on your Summer Bucket list? Make a picnic and go to the beach, lake or park – Summer is a great time to explore your local parks and beaches. Allowing kids to be involved in the decision making can be a good thing. Have your kids plan the menu, prepare the food and you can relax. Let the kids pack the basket! Scavenger Hunt and Ice Cream Party – Kids and summer sometimes make for forgetful clean up. During the week collect all the left and abandoned toys and clothes kids leave lying around. At the end of each week hide all the toys and other trinkets you’ve collected and send them on a scavenger hunt. Celebrate with an ice cream party. Kindness Rocks and Lemonade? – Setting up a lemonade stand is a rite of passage for many kids and families. To make it more fun, add a little kindness! Before the sale, gather some rocks and set up a creative space with paints. Let the kids decorate the rocks with their own positive messages and pictures. On opening day of the lemonade stand, share the rocks with your customers. After the sale, let the kids leave the rocks at a local park or playground. Check out The Kindness Rocks Project to learn more about inspiring others with kindness rocks. Camping – KOA is a great resource for locating affordable campsite options all over the United States. Ask the kids to log on and investigate which campgrounds interest them, make your reservation and get ready to camp! Or, keep it simple and camp in the backyard! Pop up a tent, invite some friends, and set the kids up for an easy overnight adventure. Go to a Baseball Game – Baseball is a huge summertime favorite family activity. Follow the crowds and check out a major league game, or support your local teams and check out the Official Minor League Baseball website for games scheduled in your area. Homemade Water Slide and Hula Hoop Bubbles – On those hot days when the kids need to cool off these are two awesome activities that can keep kids busy for hours. Grab a long sheet of heavy plastic from your local hardware store, set up in the backyard and turn on the hose. A great compliment to the water slide is letting your kids create giant bubbles with a hula hoop. Simply fill a kiddie pool with the magic bubble formula (5 gallons of water and 10 cups of dishwashing liquid) and let your kids create giant bubbles! Get out of the house! Head to a local museum, movie theater, skating rink or bowling alley. Many of these venues offer “kids day” specials during the summer months. Most museums even have a “free” day. If it’s raining, you could get lucky! Crafts and More – Dollar Store Shopping Day – Creative, convenient, cost effective and fun! Take the kids to the local dollar store – give them $10 bucks and see what craft ideas they come home with. There are so many great items to be found at the Dollar store – the kids will have fun shopping for the supplies and creating crafts for hours. Thrifty Donation Day – Summer is always a great time to clear out and get a head start on back to school planning. Spend some time with the kids and go through their clothing and toys for donations to a local thrift or church charity. Have the kids box them up and bring them to the donation center.